Katharina Baker, Director at the Coole Music in Gort, Galway has been very busy in recent years composing music for youth orchestras and young chamber groups (along with many other musical activities). A number of her works for junior orchestras have been premiered by the combined orchestras at the Coole Music Orchestra Festival (previously the Junior Orchestra Festival) and have managed the very difficult task of making over 100 young string players sound really clear and well tuned on a minimal amount of rehearsal while playing very engaging music. 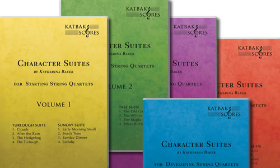 The Character Suites are a collection of original pieces written for young string players with basic technical skills and are meant as an introduction to the art and joy of chamber music playing. They are written for standard quartet with an optional 3rd violin part for groups without violas and have been described as ‘cleverly written and enjoyable for young kids.’ The books can be downloaded as an e-version or a hard copy purchased at katbak.com. All pieces have been played and performed by young groups in the West of Ireland over the past years in concerts, as lobby music, at cafés, launches, poetry readings and in many other community contexts. There are seven suites available for purchase from the web site and each comes with a description of the technical requirements for playing them – like this . .
With movement names like ‘Clouds’, ‘Sunday Dinner’, ‘Latte and Scone’, ‘Star Flyer’ and ‘Moon Groove’, who wouldn’t want to play these?! Find out more and purchase at www.katbak.com.